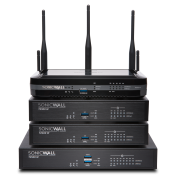 The Wireless TZ Series from SonicWall delivers a fast and flexible network protection solution for end points and small networks requiring secure wireless services. Consisting of the SOHO Wireless, TZ300 Wireless, TZ400 Wireless and TZ500 Wireless appliances, this series delivers the security technology required to keep your mobile and wired users safe, on hardware which keeps you ahead of increasing bandwidth demands. The 300, 400 and 500 come with on-board a/b/g/n/ac wireless services, support for known and unknown devices and flexible deployment options. Comparative features and statistics of the Wireless Firewalls. Click the to remove a unit and select from the list on the right to add another.